Reformy types in New York State thought, under these circumstances, it would be really cool to make any additional state aid a district receives contingent on adopting a teacher evaluation scheme based on their documented deeply flawed metrics! To ice that reformy cake, the legislature saw fit to – after slashing state aid year after year – impose a local property tax limit on districts so that they are unable to even raise the funds they would need to provide a sound basic education, if they could raise those funds locally. ohhh… but I’m just getting started here. Then came the lawsuits. That’s what makes this so fun and interesting to watch. Now, there is already a pending lawsuit challenging the overall adequacy of state funding in New York specifically for high need cities (brought by the state’s small city school districts). More recently however, we’ve been hearing of two separate cases. First, we have the state teacher’s union (as reported) suing the state over the imposition of the property tax cap, which, in effect prohibits many districts from making up the difference from the aid they’ve been screwed out of for the past several years – the aid that in theory – by the state’s own definition of its foundation formula – would provide for a sound basic education. That formula was implemented specifically to comply with a previous court order in Campaign for Fiscal Equity. Next, we have the lawsuit brought on behalf of children in New York City schools challenging the state’s authority to reduce the city’s funding by $250 million for non-compliance with adopting a teacher evaluation policy. So far, it would appear that this argument has achieved a positive, immediate response from the judge, who a this stage has blocked the state funding reduction. Assistant Attorney General Steven Schulman described the $250 million that the state will cut from NYC schools as a “drop in the bucket” and argued that it was not great enough to have any effect on schools’ ability to provide a sound basic education. The state’s defense of its actions is essentially that $250 million really isn’t that much money for New York City and certainly doesn’t deprive NYC schoolchildren of receiving their constitutionally mandated sound, basic education. And that forcing the state to provide the $250 million would undermine their authority. That is, their authority to deprive kids of their constitutionally mandated sound basic education! ? ! ? huh? Now, this is all part of legal maneuvering. Yeah… it would be difficult for NYC to show that holding back this additional 3.3% state funding tips the scales on whether the city can provide a sound basic education. As such, how can the court reason intervening and forcing the state to give this money back? 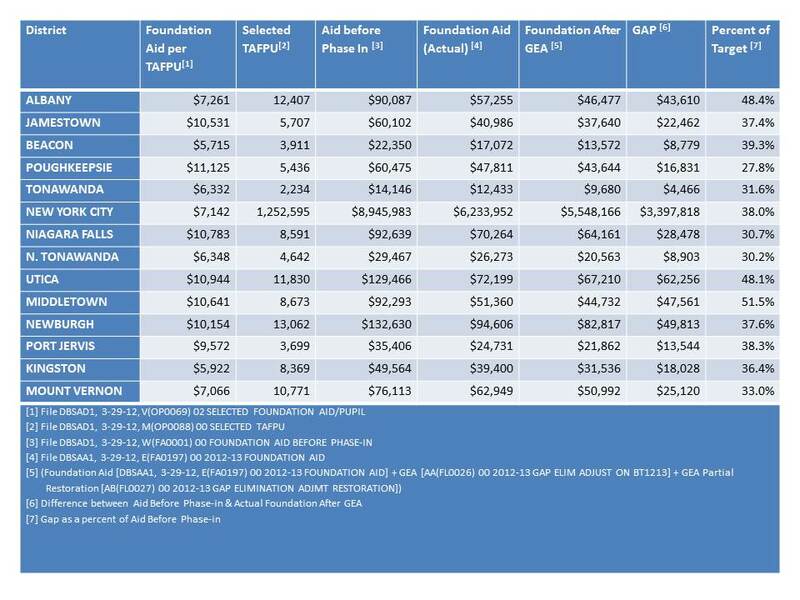 Foundation Aid, Foundation after GEA expressed in Thousands (‘000s) New York City is being shorted about 3.4 billion in aid to achieve what the state has defined as “sound basic” funding. That’s about 38% of their total foundation aid. That share is even larger for some small city districts. 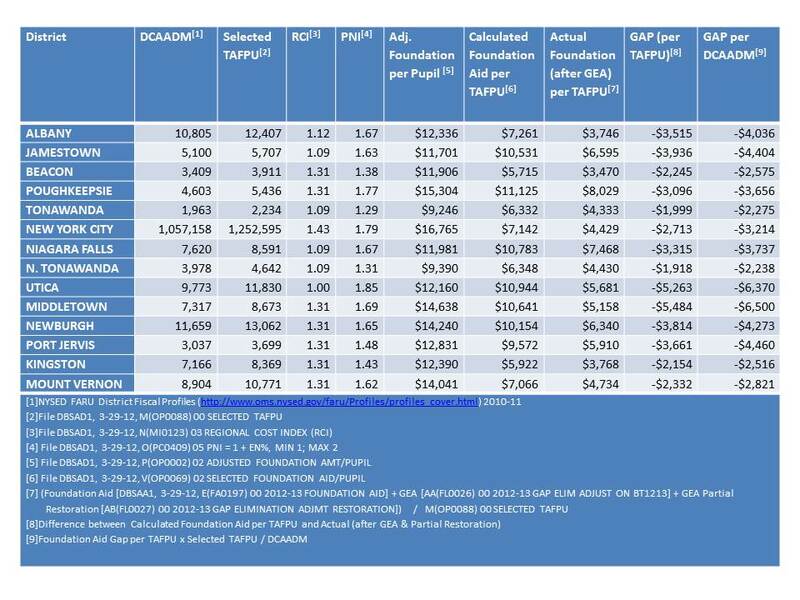 This next table shows that this amounts to thousands per pupil. Sure, the loss from the teacher evaluation debacle amounts to a few hundred per pupil. But hey, what’s the harm? NYC is already being shorted over $3,000 per pupil.By the state’s logic, we, and the sitting judge are asked to ignore that the bucket into which that drop is to fall (or not) is nearly half empty (no, not half full… well… actually… about 62% full) to begin with. That the murder who stabs to death a victim one day, and comes back to stab the already dead body one more time the next, is not guilty of any marginal crime for his actions on the second day.Perhaps not in the final legal analysis. I’ll leave that for the judge to figure out. But in my view, it’s still pretty damned offensive. Next What does the New York City Charter School Study from CREDO really tell us?